The material of case is iron or stainless steel. It applies to pressure gauge. And there are several types of case suitable for liquid filled gauge, such as 1.5", 2.0", 2.5", 3.0", 4.0". The material of movement is semi-brass, or completer brass or stainless steel. It is mainly used for pressure gauge. If there is some special request, please contact us. The material of connection is copper or stainless steel. It is used for pressure gauge. Connection is of high grade cutting. 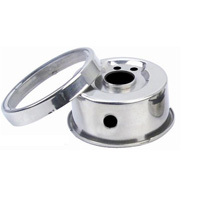 Its threads, length, size, plat and socket can be made according to customers' requirements. Ma Anshan Exact Instrument Co., Ltd is a professional manufacturer of all kinds of high quality instruments and Pressure Gauge Parts. Our company specialize in designing and manufacturing standard pressure gauges, refrigerator gauge, CNG pressure gauge, industrial thermometer, case, movement, pocket, connection and so on. Our products are widely used in oil, chemical industry, metallurgy, electricity, manufacture, papermaking, food, energy, etc. Our products have been exported to U.S.A, Canada, Europe, Spain, Egypt and South-east Asia, mid-east and so on. Thermometer PartsIts material is iron or stainless steel. There are types of case used for thermometer, such as 2.5", 4.0", 6.0". The material of pocket is copper or stainless steel. Pocket is used for thermometer. It is designed to screw in three parts of fabricated equipment, model 1800 for example.